I'm back with another outfit of the day! I am trying to do one at least once a week. This outfit looks put together and it's also comfortable! I'm going to start with accessories; I kept it simple and just wore my James Avery charm bracelet. I also wore a white beaded headband that's my mom's and she got it from Maurice's. 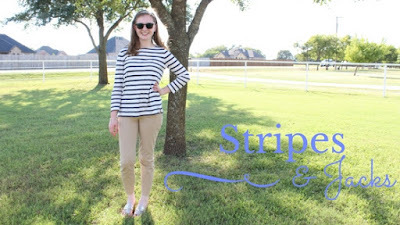 You can see it with the outfit a little later in this post. For shoes I wore my Jacks which have become my favorite sandals. I definitely think these are an all year round shoe! My navy and white striped shirt has 3/4 length sleeves and is from Old Navy. I have the same shirt in red and white that makes me look like Waldo and these shirts are so cute and match pretty much everything. 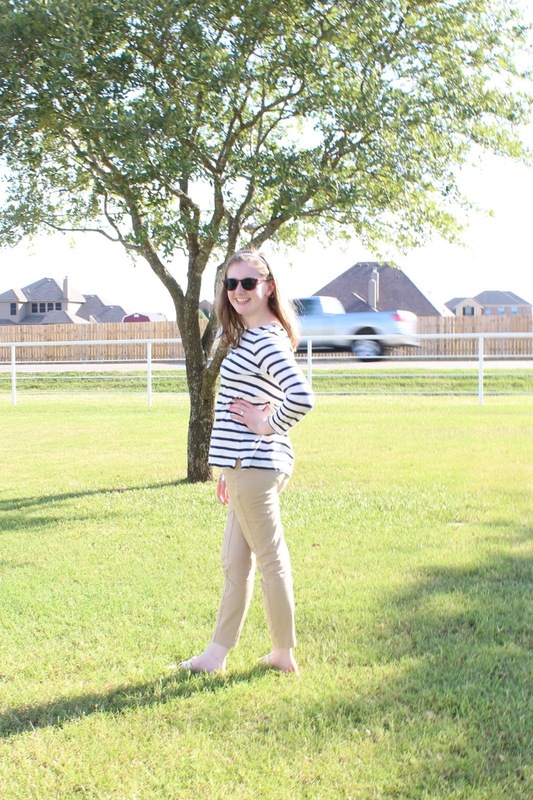 My khaki pixie pants are also from Old Navy and they are so comfortable and make an outfit look a lot nicer than wearing just a pair of jeans.